Solo: A Star Wars Story opens next week but the reviews are already out there in the atmosphere. The general feeling is that it's entertaining and opens up a wealth of future possibilities for the Star Wars universe. Sequels could happen if audiences respond well to this one, and then there's the chance of spinoffs following certain characters. While rumors have floated that an Obi-Wan Kenobi film would be the next standalone effort from Lucasfilm, Kathleen Kennedy has another idea in mind and it seems she and I are having a mind meld moment. There are many reasons why this makes sense. 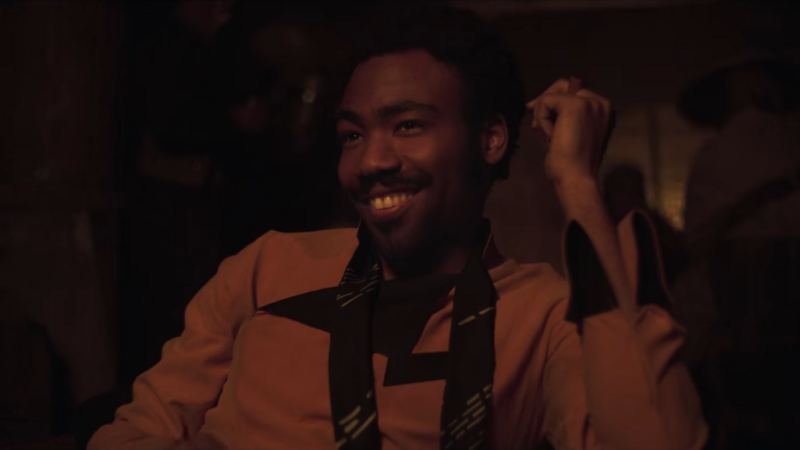 First of all, Donald Glover's performance as Lando is getting the most praise of anybody in the cast. I pretty much dedicated an entire paragraph of my review to how good he is and the potential for him to lead a franchise of his own. Second is that Glover is red hot right now, coming off the latest season of Atlanta, and a little video you may have seen called "This is America." It's always good to strike while the iron is hot and an announcement of a Lando Calrissian movie would do the trick. Kennedy's wording is curious, though. I hope this doesn't morph into a Han Solo movie with just a little more Lando in it, because a true film featuring the caped smuggler could reach an audience on par with Black Panther. That's one Hell of an incentive to put a lame Kenobi movie on the shelf for a while. "I really just want to see him, like doing all of that. Still doing anything. Like, I think that would just be fun to just see him just like... Because like, we see him change so much... He's just like, I think charismatic and people are like, you know what, you should own this city. You should own Cloud City, like that kind of thing, or like winning. So I think it would be just nice to see like, oh, like I'm a General, and now I'm mad at this hotel, and then now, I'm just like... I think that will be just funny but also cool to see like how far charm gets you. Almost like a 'Catch Me If You Can. A space 'Catch Me If You Can' ."